"If you ask any RSPCA officer which animal they feel most sorry for, it's usually the poor, forgotten rabbit sitting in a tiny hutch without the proper food, or any food at all, and some dirty water. It might once have been loved for a brief time by some child, but it has quickly been forgotten and it's a very sad sight that I have seen countless times." Looking after the Patch during his illness was an exhausting and worrying experience that brought to my attention the suffering of these gentle creatures who are the third most popular pet here in the UK, though I refer the term companion animal. Without our intervention Patch like many rabbits would have died in agony alone abandoned in a hutch, his suffering unnoticed. Through care and medical intervention his life was extended by two years and when the time came that his medicine was no longer effective he was humanely put to sleep. As you will read in the link above Patch suffered with Gastro intestinal (GI) Stasis which in his case was the result of a swelling in his intestine which at first was thought to be benign but which was nonetheless causing soreness and putting him into stasis. GI stasis is a common condition in rabbits in its own right or as sign of an underlying less obvious condition. In either case unless treated immediately within twelve hours or less it becomes life threatening therefore veterinary treatment is required urgently. GI stasis without veterinary care not only has fatal consequences it is an extremely painful way to die. 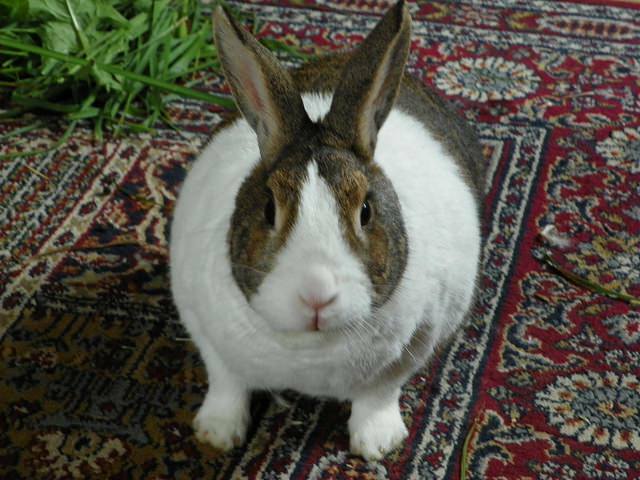 If during the course of GI stasis the unfortunate rabbit gets bloat his stomach may fill with gas or liquid and burst. Consequently many rabbits abandoned in hutches at the bottom of someone's garden will die an agonising death alone and uncared for. Rabbits are often brought for a demanding child as though the poor creature were some animated toy, the child soon looses interest and the parents can’t be bothered beyond providing water and food - that is if the unfortunate rabbit is lucky. Many are simply let loose, dumped at the local sanctuary or killed. "Treacle is a Rex rabbit, this is an average sized rabbit, not a giant. Her body fills the whole living area of the hutch. She certainly can’t stretch and run freely, and there are no toys, food bowl, hay rack in here." 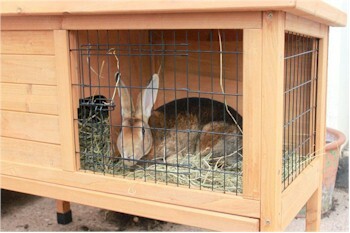 Read More http://www.rabbitwelfare.co.uk/reality-of-small-hutches.htm - lots of good advice about the care of rabbits. I though have to say in my opinion the ideal situation is to look after your rabbit as a house rabbit with access to the garden which includes a large hutch for when he or she wants a bit of quiet time outside as did Patch from time to time. Rabbits, who are by nature pry animals, do not show their illness, they hide it so not to make themselves easy pry. This has not changed as a result of domestication and it is difficult to tell when a rabbit needs attention unless you have learned to know the signs. For example with GI stasis a rabbit will be lethargic not eating or drinking and will stop defecating. This may happen gradually with droppings getting smaller and less frequent or occur suddenly without warming and there will be no droppings at all. 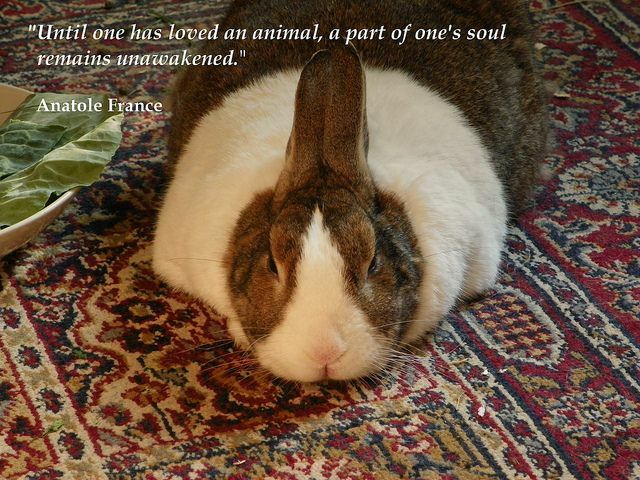 As a result of ignorance and neglect - to not educate yourself about your companion animal is to my way of thinking neglect- many rabbits die a painful death. It may surprise those of you who appreciate rabbits as sentient beings that many people do not take a rabbit to the vet considering that this is not necessary or required? A neighbour once said to me “You don’t take rabbits to the vet” I knew what she meant and was tempted to resort to a sarcastic reply along the lines of “Wow I didn't know that rabbits don't get ill, ?” Not to question such nonsense is the height of ignorance and is neglectful and cruel. One dog owner worried about vet bills for the dog but never gave the same worry to the rabbit. Why? Rabbits like your dog or cat get ill, they suffer pain and fear just like your cat and dog and like these more pampered pets need veterinary care as do hamsters and other small furies who in the main are equally neglected. A recent conversation at the local supermarket greatly disturbed my husband and I. The cashier after looking horrified that the herbs we were buying were for our rabbit - after all the rabbit usually gets old wilted leftovers if he or she is lucky - went on to tell us about her sister whose child had pestered for a hamster and soon got bored once the novelty had worn off and thereafter left the care of this tiny defenceless creature to her mother who openly said she hated the hamster and wanted him to die. The cashier went on to say how the hamster was now sick and her sister hoped he would soon die. No she was not going to take the poor creature to the vet. This story haunted me and still does. I told her she should tell her sister to take the animal to the vet that the poor animal was most likely in pain, but not knowing who these people were, not even a name there was nothing I could do. There needs to be laws that prevent any one and everyone from walking into a pet shop and buying a rabbit or other animal including cats and dogs. Back street breeding should be outlawed for a start off, along with the sale of rabbits and other animals on-line or in newspaper adverts. Animals should not be sold as a commodity in pet shops but rather adopted from sanctuaries where the prospective owner or guardian - I prefer the term guardian as no one has the right to own another living being - is checked out for suitability by a home visit before adoption is allowed to take place and that periodic inspections continue thereafter. It concerns me greatly whenever I go into a pet shop and see these defenceless creatures for sale, openly exposed under bright lights to the gaze of prying eyes - rabbits need places to hide from view. Even more worrying is the fact that anyone over the age of 18, sometimes younger, can go to the counter and buy a rabbit, a guinea pig or other small fury as one would go and buy a bag of sweets or other inanimate item. The defenceless animal has no say in his or her fate, shoved into a pet carrier he or she is taken to who knows where by who knows who for whatever purpose the purchaser desires and no one is the wiser. The rabbit may be fortunate and go to a caring forever home or he may end up abused and neglected with his life expectation likely much shorter or even wilfully abused. Please sign the following petitions - all the petitions including the one to the Scottish parliament may be signed by anyone one worldwide. Scottish Parliament & the UK Government as a whole: Implement urgent (pet) Rabbit Specific Welfare Laws in the UK https://www.change.org/p/scottish-parliament-the-uk-government-as-a-whole-implement-urgent-pet-rabbit-specific-welfare-laws-in-the-uk - Though most of the comments are old the petition is active, please help it get more signatures by signing now. 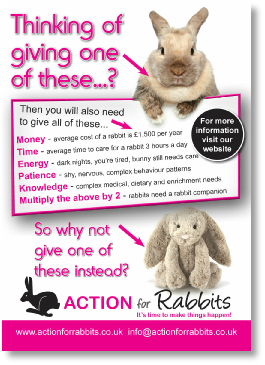 New petitions and other actions to help rabbits will be included when they become available.